Cloudy skies with a slight drizzle, definitely just an occasional day in Massachusetts. Ponchos being handed out, phones being used in ziploc bags, the turbulent final day of Boston Calling had officially commenced. Many greats acts were scheduled to perform, but all eyes were set on the green stage for the return of the rap god, Eminem. Here's how the day played out. Initially given ourunfair judgement for their quirky band name, Pond ended up being fairly pleasant to see. Their style is groovy, yet futuristic with a touch of old school tang to their getup. The band drew in one of the most diverse crowds of the weekend, many having waited a long time to witness these odd bunch take control of a larger stage. Unbeknownst to many, some of the band members have affiliation or are currently a part of the esteemed psychedelic rock band, Tame Impala. Each of their talents translated well, and it seemed like all five members of Pond were stoked to be contributing to this fun wildcard of a project. George and friends from Toronto waiting for Thundercat. Thundercat could not have been any better of a transition on the green stage. Following Pond came the presence of this electrifying enigma-- fresh off his LP album release, which he titled Drunk. Ripping masterful bass riffs with no visible effort, this LA based musician gave everyone attending his show something to brag about. Along with the onstage talent, the weather perfectly matched the mood-- a tolerable rain that at times closely resembled snow. Chants of "Thundercat" could be heard being yelled by many from the left side of the stage, which seemed to have conveniently drawn most of the bassist's fanbase. A few enthusiastic attendees had gotten their picture taken and could be found shown on the left. A better idea of the described setting can be seen in the video below! The Decemberists were one of the acts to show that flashy production doesn't matter. Having a massive design displayed behind them, the band, especially lead vocalist Colin Meloy, improved like it was a god given talent. 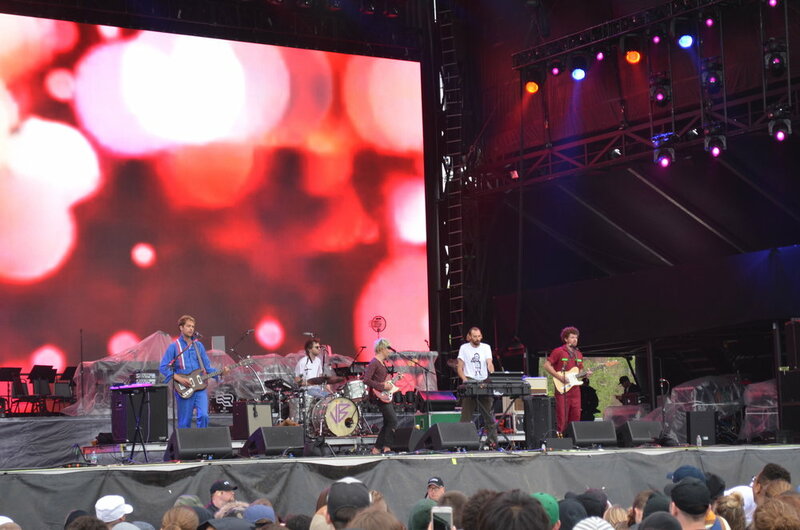 Singing back relatable and downright hilarious lyrics made this indie rock band stand out among their contemporaries, to the point where thousands of festival-goers gathered to take in The Decemberists warm and homely vibe. Dry humored jokes and indie rock were just what the doctor ordered for the rainy day, which made an hour fly by through feeling more whimsically breezy, rather than miserably cold. Meloy even went on to say that the band's music is best enjoyed and understood during this rainy type of setting. See for yourself and let us know your thoughts! The Decemberists performing “Rox In The Box”. After fourteen years of absence from the city, the one and only slim shady had finally made his triumphant appearance. Many waited all weekend, even at the stage for the entirety of Sunday, to finally see one of hip-hops best spread wisdom on the mic. This final headliner brought much more than that, with Eminem flexing his countless hits and being backed by a live ensemble, as well as bringing out numerous special guests. Having the support of The Alchemist DJing his music was one feat for the show, but to bring out Royca Da 5'9'' for a special performance of "Fast Lane" was just plain spoiling the audience. The crowd erupted in cheers with the appearance of vocalist Skylar Grey, who came out to perform a few songs; including their hit single, "I Need A Doctor". The visuals were grand, showing those that aren't familiar with hip-hop that seeing Eminem is a no-brainer concert goal to get checked off. See for yourself below, with our recording of "My Name Is". This closing show of the festival lived up to and far surpassed expectations, as Eminem is easily the most impactful and globally renowned artist to have ever touched down and taken the mainstage at Boston Calling. Eminem performing “My Name Is”. The media tent was given the honor of hosting multiple vendors over the weekend, one of which being Whole Heart Provisions. Whole Heart's salad was one of the cleanest eats to have been served at the festival, with a variety of natural ingredients, including an unexpected but much needed bottom rice layering. Coupled with a burger and a Sam Adams helped balance out nutrition intake for lunch, which is where this particular meal may fit in best. The salad also appeared to be suitable for a wide variety of dietary preferences, including people who are vegetarian. Whole Heart Provisions, you guys are killing it. Boston Calling 2018 was a phenomenal to attend, explore, and report on the blog. We at WIRE are grateful and send out many thanks to the Boston Calling team for having us partake for the third year in a row. Improvements have been consistently looked at and made, and we can't wait to see what the future holds in store for this newly emerged east coast staple.